The SEC for better or worse has inherited Mizzou and all their whiny fans. Let them know what you think about school by using this digital wallpaper that even a Mizzou grad could figure (with some help). Download the desktop wallpaper so all your Mizzou colleagues know where they stand. 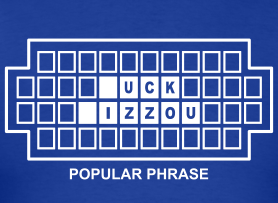 Also check out the new Wheel of Mizzfortune shirt at the Muck Fizzou store.